(Newser) – In 1200BC, an earthquake took down a 43-foot statue of Amenhotep III, the grandfather of Tutankhamun. More than 3,200 years later, it's once again standing in Egypt, thanks to archaeologists who reassembled its 89 sizable pieces and many smaller fragments. 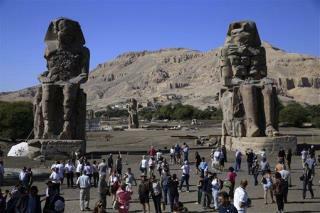 Its 121 tons now lord over those who pass the northern gate of his funerary temple in the city of Luxor. As AFP reports, the temple is already famously home to twin statues of the pharaoh, in this case seated, that are more than 70 feet tall. Hourig Sourouzian, the archaeologist who heads the team working at the temple, calls the re-erected statue one of "the highest standing effigies of an Egyptian king in striding attitude"; a second such restored "striding" statue of Amenhotep III has been in place since March. I have mixed feelings on this. On the one hand, it is cool that an ancient work of art (regardless of purpose) is being restored. On the other hand, the earthquake that knocked it down is part of the statue's history that is being virtually erased by the restoration work. Now, there's a statue to worship. Huh? All Catholics invited free! Bring your knee pads.